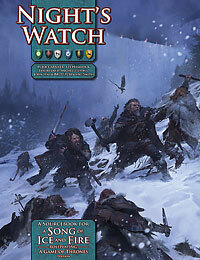 Night’s Watch gives you everything you need add this once noble order to your A Song of Ice and Fire Roleplaying chronicle. It includes rules for playing men of the Night’s Watch and wildlings alike, as well as new information about the mysterious Others. Pray, men of the green lands, for Winter is Coming! When you pre-order, get the PDF for just $5! (Or you can just buy the PDF. We also have a second PDF preview available, The Spearwife, to go with the first, Night’s Watch Introduction. //greenronin.com/wp-content/uploads/2017/07/RoninBanner-1.png 0 0 Evan Sass //greenronin.com/wp-content/uploads/2017/07/RoninBanner-1.png Evan Sass2012-09-24 11:46:432012-09-24 11:46:43Night's Watch: Pre-Ordering Now!